Since Puli is killed due to the differences of opinion between S J Surya and Vijay, S J Surya is getting ready with his next movie, Isai. The plot tells you how a cunning assistant music director comes to the top. As you guessed it, it is all about music in cinema. 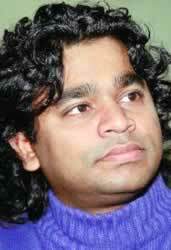 A R Rahman scores the music and according to inside sources, Rahman is said to be excited about the project. Rahman-Surya pair has always been a hit churning out innovative and out of the line tunes. This project seems to be no different. Rahman is considering using instruments never used in Tamil movies before. Isai may be produced by either Nick Arts or by Appachan. Once Surya completes Isai, he will take up Thirumagan. Hope the movie turns out to be an Isai bonanza for ARR fans!! Secret behind Vikram’s awesome acting talents? Sridevi to finance Godfather ?! Choking Trisha and an angry Chiranjeevi Who reads about Trisha’s gossip first? Thanks to Kushboo:Maxim sold out completely Selva’s Ajith starrer – Sonia picked.